GOG has launched a new weekend sale discounting its Dungeons & Dragons games up to 75 percent. GOG, ever the propagators of things old and excellent, have announced this week's weekend sale and it's a good one. The online retailer is launching its Dungeons & Dragons Gems promo, slicing a whopping 75 percent off its catalogue of games based on the classic D&D brand. This isn't the first time, of course, that it's put these games on sale, but we hardly think you'll blame us for pointing you in the direction of a $2.49 copy of Baldur's Gate. There is one caveat. 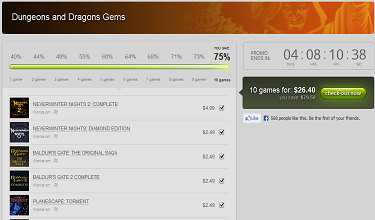 To get the full 75 percent discount, you need to buy all ten of the games on sale. In turn, the fewer games you buy, the less your discount. Buy five instead of ten, for instance, and your discount drops to 60 percent. If you're only interested in picking up one game out of the mix, you'll only be given a 40 percent discount. It does put a bit of a damper on the sale to see the prices rise the more items you remove from the total package, but even with the lowest discount the most expensive game on the list is only $11.99. The list itself is a bevy of classic RPGs including: Neverwinter Nights 2: Complete, Neverwinter Nights: Diamond Edition, Baldur's Gate, Baldur's Gate 2, Planescape: Torment, Icewind Dale, Icewind Dale 2, Forgotten Realms: Demon Stone, Dungeons & Dragons: Dragonshard, and The Temple of Elemental Evil. Buying all ten together will only cost you $42, which when you really think about it isn't all much to ask for a set of role-playing games that could easily last you a year and then some.